How can I access my pay stubs and W4 information? Click on the green Sign In box at the top of our webpage and enter your username and password. I don’t remember my username. What do I do? Please contact your employer. They should be able to lookup your username via their client portal. On the sign in page, click the “Forgot Password” link. Enter your username and email address to receive a temporary password. Note: You must enter the email address that is associated with your employee access portal. 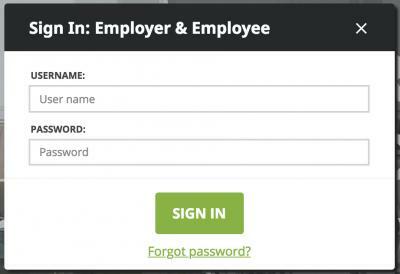 If you have multiple email addresses and cannot remember which address is associated with your Payroll Vault employee access portal, please contact your employer. Use this temporary password as the “Old Password” in the reset process to create a new password for your account. I don’t currently have access to a computer, can I access my pay stubs on my mobile device? Absolutely. Our website, is completely mobile friendly and you can access the same log in pages as you would on a computer. I have a question about my pay check. Please contact your employer regarding any questions on your pay. How do I change my address and W4 information? 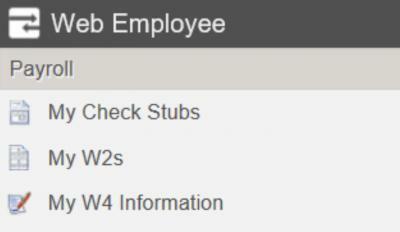 Click on “My W4 Information” in your employee access portal to change this information at any time. You may also submit an updated W4 form to your employer to make these changes. Ask your employer for a copy of this form to complete. Submit an updated Direct Deposit Authorization form to your employer, along with a voided check for the new bank account, or a print out with this information from your bank. Ask your employer for a copy of this form to complete. I lost my W2. How can I get another copy? Copies of your W2s are available through your employee access portal. Log in to your account and click on “My W2s” to view, download, or print a PDF copy of your W2. Your employer will also have access to copies of your W2 in their employer portal. I called Payroll Vault and they were not able to help me. Why couldn’t they provide me with details about MY account? We really do want to help but we must do so through secure channels. Payroll Vault’s greatest priorities are providing outstanding service and protecting our clients and their employees. In such a technology advanced era, personal data theft is becoming an increasing problem and we want to protect your personal data from getting into the hands of any unauthorized individuals. To do this we only communicate directly through our clients. Please have your employer reach out to us and we will be sure to let our service shine. What is the deadline for reporting payroll to Payroll Vault? Generally, the deadline for reporting payroll is three business days prior to your payroll date, in order to meet banking deadlines set forth by our banks. These deadlines may vary by location, so please contact your local Payroll Vault office for their specific deadlines. If the deadline is missed, paper checks are an option and can be issued for payroll information received past the deadline. What options do I have for reporting my payroll information? In our efforts to be as green and efficient as possible, we offer numerous timekeeping and electronic payroll reporting options. Contact your local Payroll Vault office for more information on the available reporting options and how our solutions can best fit your business. When will the funds for payroll be taken out of my bank account? Payroll funds will generally be debited from your account two business days before your payroll date. This debit will include transactions covering direct deposit funds, taxes, fees and any vendor payments. These dates and timelines are set forth by our banks and may vary by location – please contact your local office for the specific timeline that applies to your payroll. How do I access my portal and view my payroll reports? To view your payroll reports, click on the folder on the left side with your business name. Payroll reports will be sorted in folders based on the pay date. My business is always on the road and I don’t always have access to a computer. Can I access my payroll reports on my mobile device? I have a new employee. What do I need to do? Download a new hire packet from your online portal and have the employee complete all the appropriate forms. Submit a copy of the W4 form, direct deposit authorization form, and voided check, to your payroll specialist. Payroll Vault will do all of the new hire reporting to the state on your behalf. How do I report employee changes? If you report payroll on the portal, you can enter in the changes at the time you are entering your payroll. If you report your payroll via a different method, you can remit all changes to your payroll specialist at the same time as you are reporting your payroll. What do I do if I receive a payroll tax notice from the IRS, State or Local municipality? Send a copy of the notice to your payroll specialist immediately. We will investigate the resolution and communicate it back to you. We are always happy to assist our clients with these notices. Typical payroll audits include Workers’ Compensation and SUTA (state unemployment) audits. Payroll Vault can help you pull together the reports necessary for these audits. Simply send the audited time frame dates to your payroll specialist and we will run the applicable reports. What if I need a special report? Please send an email or give us a call with the parameters you require for your special report. We will run the report and either upload it to your portal or email it to you. Please keep in mind that payroll is our top priority, so please allow us time to fulfill your request. Also note that while we have a vast library of payroll reports available, if the report you are needing is a custom report, additional charges may apply to have the report created with the parameters that you require. When will my employees receive their W2s? We will process the W2 forms starting the first week in January. They will be sent to your business address once completed for you to distribute to your employees. You can expect these to arrive by the last week in January. The IRS requires the W2s to be handed out or postmarked to the employee no later than January 31st. Electronic copies of the W2s will also be uploaded to the employees’ portal accounts once they have been completed. Why can’t I have my employee call you directly for help? We really do want to help but we must do so through secure channels. Payroll Vault’s greatest priorities are providing outstanding service and protecting our clients and their employees. In such a technology advanced era, personal data theft is becoming an increasing problem and we want to protect personal data from getting into the hands of any unauthorized individuals. To do this we only communicate directly through our clients regarding sensitive employee information.